I have easily cooked twenty turkeys in my lifetime and have no issues with the bird... but I'll admit to feeling a wee daunted with the turducken. Tom and I have had a lovely relationship, consisting of sausage stuffing and Granny Smith apples. I make sure to always buy one when they go on sale (to throw in the freezer for a meal or batch cooking), and I almost always boil down the carcass for soup. Since we weren't hosting Christmas dinner, I decided to use the turducken for Xman's 7th birthday with family (Jan 3). I thawed the bird out over a few days in the refrigerator and made myself read the directions, so I knew what I should be aiming to do. Bake at 225 degrees F for 5 to 7 hours, uncovered. I expected to be cooking the turducken at low temperature, but I did not expect to leave it uncovered. I usually cook my birds in the roasting pan covered, but ok-- I'll play along. The instructions said to place on a roasting rack (which I could not find! ), so a muffin tin filled in. 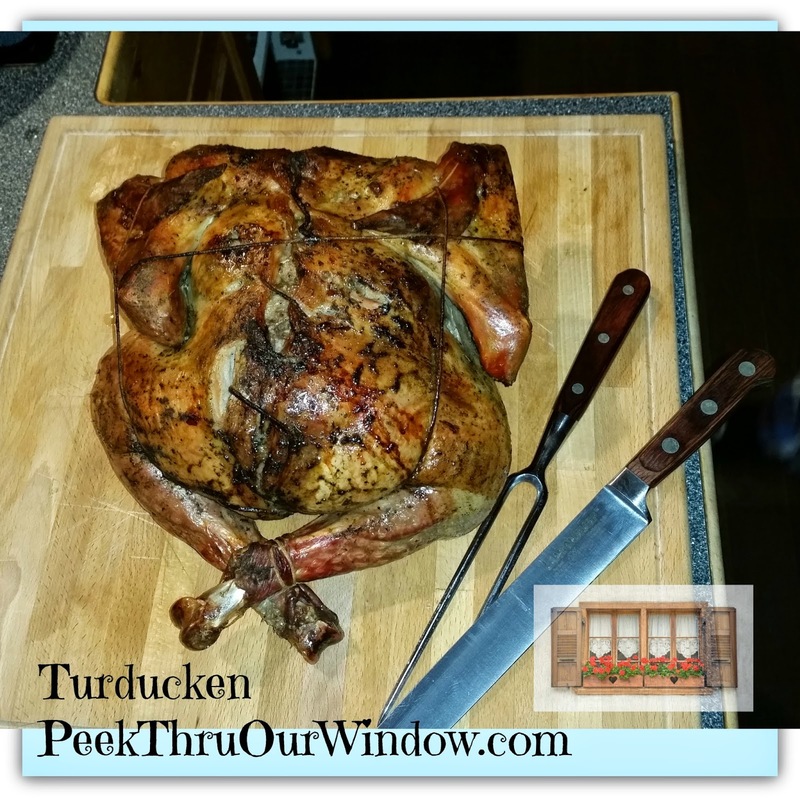 The thawed turducken was a little tricky to hold, so be sure to support it well. Once the bird was unwrapped, we simply plunked it right into the roaster... ready to go, easy peasy! This was certainly a nice feature. I quickly realized that picking the turkducken up was a little tricky-- no bones make for no support, so be sure you hold it well. I will warn there were times I thought the bird was not cooking at all! But that... was all in my head. 6hrs roasting time = this gorgeous bird! Yummy! The turducken was finished around the 6 hours mark, smelling awesome and looking juicy! After letting it sit for a few minutes, we cut the legs off (which are normal turkey legs) and simply sliced the rest as you would a roast. 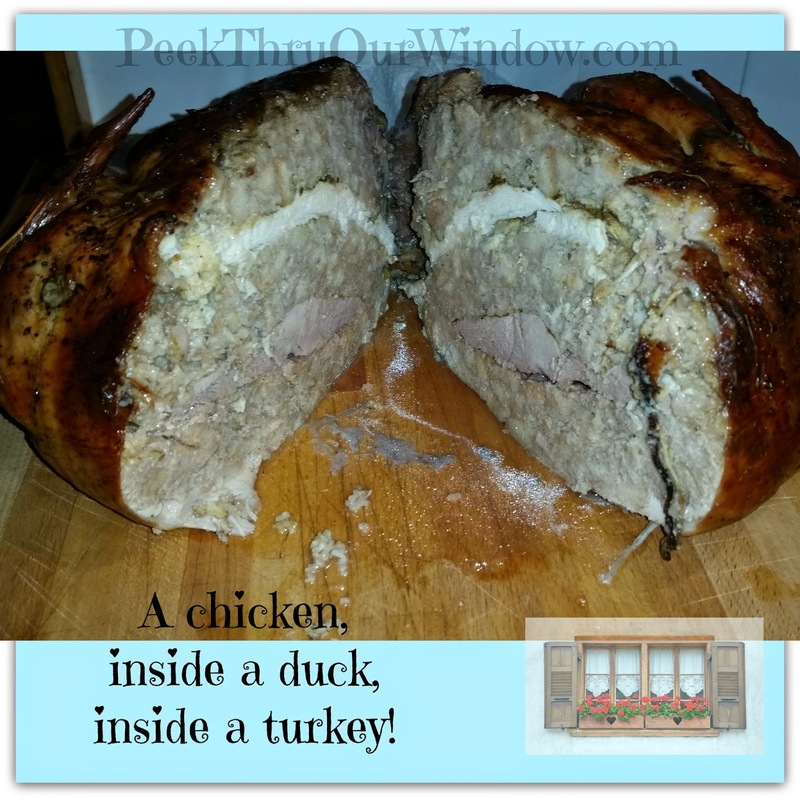 The inside was made up of layers of chicken sausage stuffing, duck & turkey. OMG, the answer is YES! My kids woke up the next day asking for turducken for breakfast, lol, so I think the turducken wins huge accolades from this household.